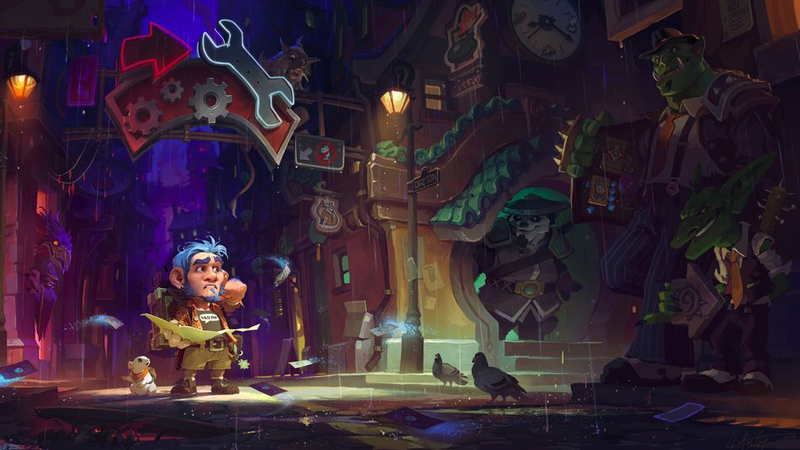 Mean Streets of Gadgetzan came out last Thursday and I’ve been playing around with it for a few days trying to tease out some of its secrets. While it’s chaos in the world of Blizzard’s collectible card game at the moment, the distinct style and mood of the latest expansion has me enjoying this brief period of disarray. A lot happens when a new Hearthstone expansion gets released. People unleash their gold reserves on new packs, rifling through for enough cards to wander down the path of one of the strategies they’ve cooked up in the days and weeks prior to release. 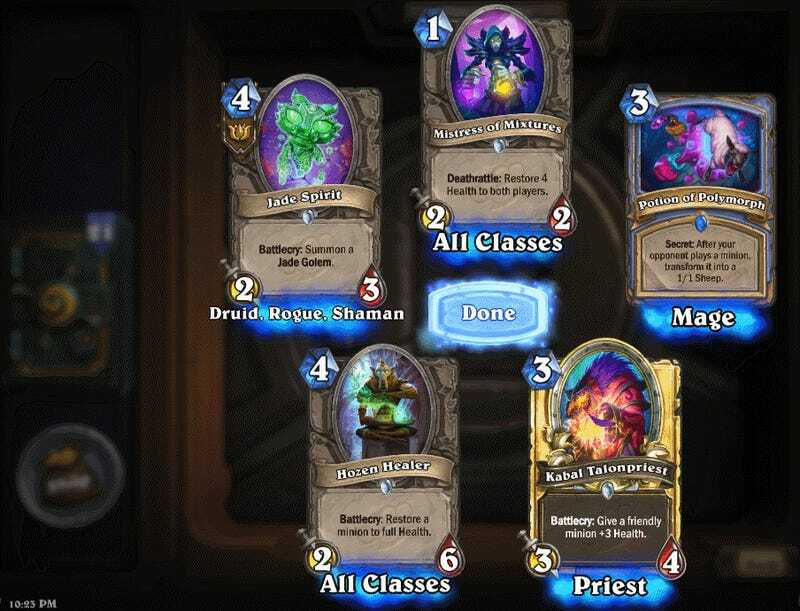 Somehow you never get as many legendaries as you expected, especially when a bug in the game is leading players to receive abnormally high numbers of duplicates on release day (a problem quickly addressed by Blizzard). In many ways, however, this is the best part of Hearthstone: watching how the community and different players grapple with a slew of new cards before the dust has had time to settle on different strategies and consensus on a new meta is reached. I’ve often been disappointed with how fleeting this post-expansion period is, but the promise of Mean Streets of Gadgetzan is a collection of cards with enough playful style and personality to give the game a life beyond grinding ranked ladders for incremental gains in a sea of predictable builds and familiar combos. Gadgetzan is a city rife with economic opportunity as well as criminal factions vying for power to determine its future. 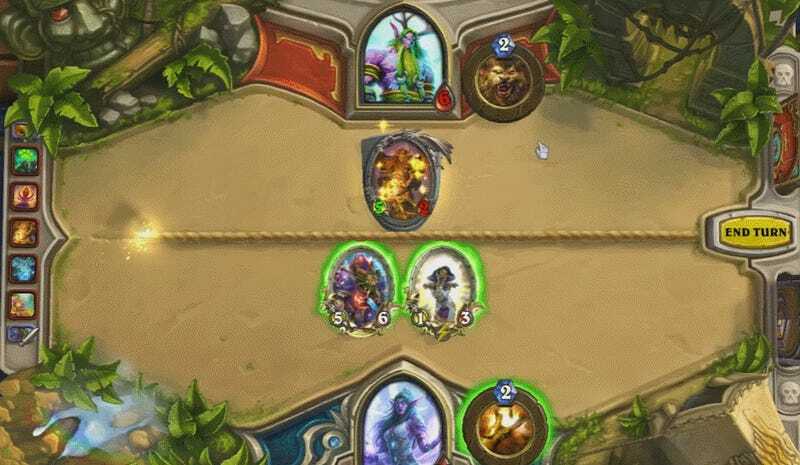 It’s an easy metaphor for Hearthstone itself, where different design principles and goals compete to determine the outlines of the game and how it’s played. At any moment, there are fault lines in the Hearthstone community over what exactly is broken in the game and how it should be fixed. How big of a role should RNG play in determining outcomes and constraining strategy? Are Shamans too powerful or are players just not employing the right counter-builds. Will it finally be Priests’ time to shine or is target healing for two points simply to limiting of an ability? No expansion will ever settle those questions, or others, but each new one can offer a breeding ground for a more nuanced exploration of them, and the way MSG employs things like tri-class cards and unique factions—families of cards connected by a shared backstory and repeating mechanics that transcend particular heroes and minion types—have the potential to make searching for the answers to a new meta more fun. The Grimy Goons, Jade Lotus, and Kabal each add another layer to the game that not only makes it more complex, but also directly ties those complexities to a larger narrative about greed, corruption, and power taking place across the new set of 132 cards. Sure, Blizzard’s take on MSG is more Guys and Dolls than Chinatown, but compared to expansions like Whispers of the Old Gods and Grand Tournament, it has a clearer sense of place that’s interesting to explore beyond simply trying to win. A Dragon Priest deck might not prove the revival for the hero class we’ve all been waiting for, but cards like Dragonfire Potion, which deals five damage to all minions who aren’t dragons, have opened up the possibility. It’s also just a wickedly cool looking card, and one that’s fun to play precisely because of how it helps reinforce the identity of a certain type of death. Instead of just raining death from above on your opponent, Dragonfire Potion lets you taunt them for utilizing minions that are different from yours. It’s a card that doesn’t just try to reshape the existing meta, it also plays into the game’s performative aspect. Cards like Kazakus help achieve this as well. The minion lets you craft a custom spell when played as long as long as you don’t have any duplicates in your deck. This type of mechanic, which surfaced with League of Explorers’ Reno Jackson, is spread throughout MSG, and allows players to pursue a wider range of card varieties by rewarding them for keeping each card in their deck unique. But the card itself is also just fun to play because of how it plays into the story behind the expansion’s Kabal faction by effectively letting you create your own magic potions on the fly (when played you select how much the new spell will cost and what its effects will be). And then there’s the discovery mechanic, which, through cards like Kabal Courier, lets players poach their opponents decks for cards that might compliment their own. The most obvious example of this is a Warlock cannibalizing their own health in order to draw cards being able to steal a powerful healing spell when playing opposite a Priest. Instead of just trying to create a deck with as many strengths and as few weaknesses as possible, the mechanic lets you make up for vulnerabilities by playing off the enemy. In a lot of ways, MSG, despite its size, feels like one of Hearthstone’s more robust and defining expansions, and one that won’t only shake things up competitively, but will also help build out the world Blizzard’s slowly been creating with its collectible card game beyond the simple collage of World of Warcraft lore and archetypes it was originally born from.